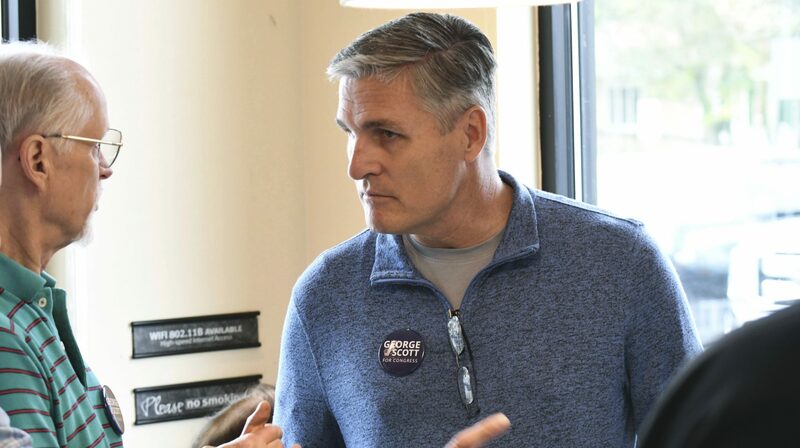 In this Saturday, Oct. 6, 2018 photo, George Scott, the Democratic candidate for Congress in a Republican-leaning seat in conservative central Pennsylvania, listens to volunteer canvassers while meeting with them, in Camp Hill, Pa. A court-ordered redrawing of Pennsylvania's House districts has forced several Republican congressmen into more competitive seats and helped establish Pennsylvania as a key state for Democrats aiming to recapture the House majority. 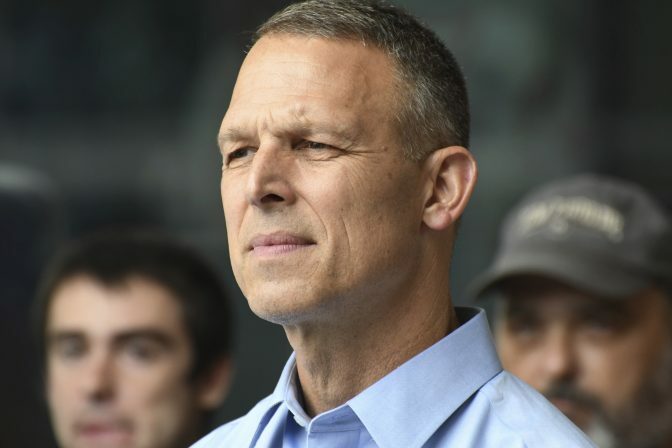 Rep. Scott Perry, who is facing a challenge from Scott, has won three elections by wide margins. In the interactive map below, you can see how each congressional district is likely to go in November, based on The Cook Political Report ratings. The darker the red, the more likely that district is to vote Republican. The darker the blue, the more likely the district is to vote Democratic. The toss-up district is purple. You can zoom in and out to adjust the view on the map. Whether Democrats take control of the U.S. House could come down to Pennsylvania. The Cook Political Report says that 9 out of 18 races here are either competitive right now or have the potential to be by Election Day. Only California has more congressional races in play, by that measure. The number of competitive districts is due in large part to a state Supreme Court decision to strike down the old congressional district boundaries, saying they were a partisan gerrymander. In February, the court issued its own map. Here’s a look at those nine races. We’ll update the information below as we get closer to Election Day, including with more information about debates, polling and important issues. Democratic congressional candidate Susan Wild stands on a stage during a campaign rally in Philadelphia, Friday, Sept. 21, 2018. In September, Democrat Susan Wild told a group of canvassers that her campaign mattered nationwide. Wild, an attorney and former solicitor for Allentown, is running against Republican Marty Nothstein, a Lehigh County commissioner and an Olympic gold medalist for cycling. Libertarian Tim Silfies is also running. A September poll by The New York Times/Siena College had Wild up by eight percentage points over Nothstein. WHYY covered an Oct. 9 debate between the three candidates, who offered different positions on marijuana legalization, gun control, the minimum wage and other issues. Nothstein recently sued a velodrome, its board president and The Morning Call, alleging that they “conspired to publicize a confidential investigation of alleged sexual misconduct against him to influence the election,” according to The Morning Call. The news organization said it stood by its reporting. About the race: Republican Scott Perry is facing his first competitive general election contest in Congress. Perry, a former state lawmaker, was elected to Congress in 2012 by 25 percentage points. He won re-election by almost twice that margin in 2014 and by more than 32 percentage points in 2016. But the new district is much friendlier for Democratic challenger George Scott. Both candidates have military experience: Perry is an Iraq war veteran who was promoted to brigadier general in the Army National Guard in 2015. Scott served 20 years in the Army, including overseas, and retired as a lieutenant colonel. Republican U.S. Rep. Scott Perry of Pennsylvania listens to speakers at a party rally with volunteer canvassers, Saturday, Oct. 6, 2018 in Harrisburg, Pa. A court-ordered redrawing of Pennsylvania’s House districts has forced several Republican congressmen, including Perry, into more competitive seats and helped establish Pennsylvania as a key state for Democrats aiming to recapture the House majority. Both candidates have a “Scott” in their name — which Perry noted recently. During the primary, Scott pointed to his military service and his experience as a Lutheran minister as a reason he could win votes in more rural areas that don’t usually vote for Democrats. And he has criticized Perry over his membership in the conservative Freedom Caucus and over controversial statements Perry made defending recovery efforts in Puerto Rico. At a Sept. 19 debate at the Rotary Club of York, Perry said he supports Rep. Jim Jordan of Ohio for Speaker of the U.S. House, according to the York Daily Record. Meanwhile, Scott said he doesn’t think Democratic leader Nancy Pelosi is the best person to bring about change for Democrats. They also debated on Oct. 5. They are scheduled to participate in a live televised debate at 7 p.m. Oct. 18 on WGAL News 8. During the primary campaign, Scott got a lot of attention for a TV ad that showed him burning a semi-automatic rifle. That ad is not on his YouTube page anymore, as Philly.com columnist John Baer recently reported. The Democrats are expected to pick up seats in counties in this more moderate area of the state, but the big question is how many. About the race: This has emerged as the Republicans’ best chance of victory in the Philadelphia suburbs. 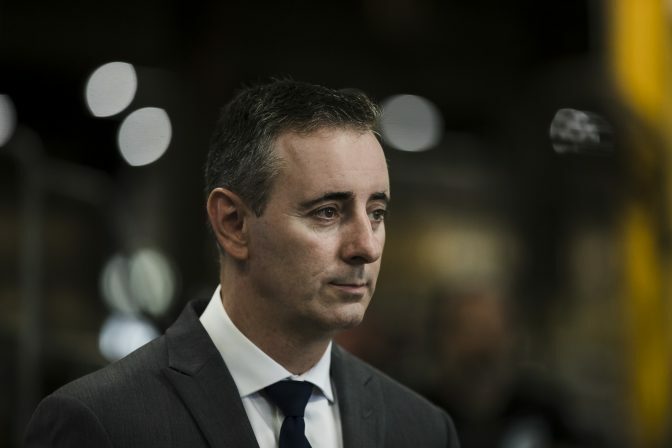 A Sept. 27 to Oct. 1 poll by Monmouth University found that while most voters in the district have a negative view of President Donald Trump and want to see Democrats take control of the House, Republican Congressman Brian Fitzpatrick still led 50 percent to 46 percent. Fitzpatrick is a former FBI agent and former federal prosecutor. He was first elected in 2016. He opposed efforts to repeal the Affordable Care Act. In August, The Philadelphia Inquirer reported that he had raised more money from labor groups than his Democratic challenger. 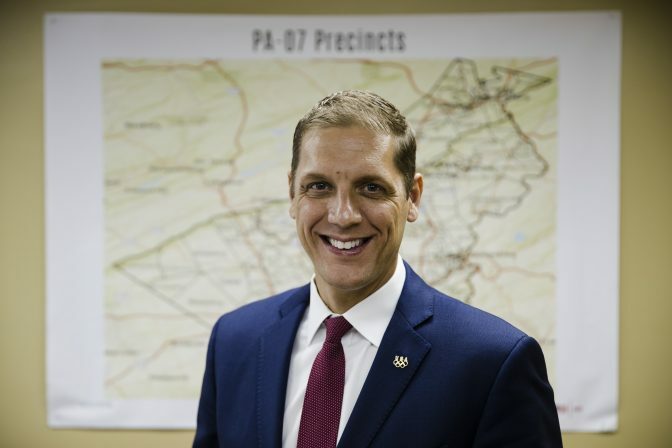 He is one of five candidates for Congress in Pennsylvania endorsed by the Everytown for Gun Safety Action Fund. The other four are Democrats. 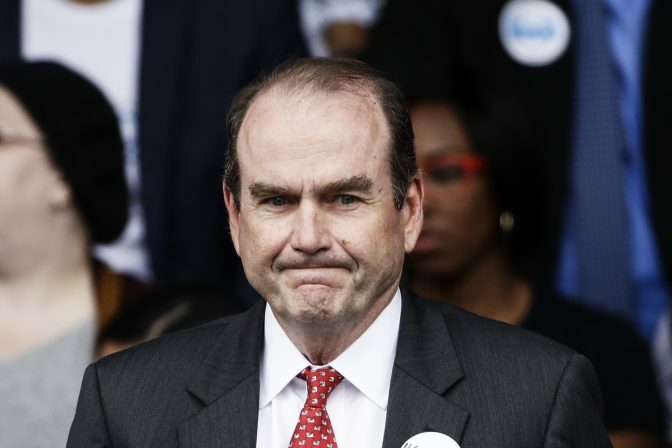 He is running against Scott Wallace, a wealthy philanthropist whose grandfather was vice president during Franklin D. Roosevelt’s third term. Rep. Brian Fitzpatrick, R-Pa., listens to a speaker during a campaign event at the Load Rite Trailers manufacturing facility in Fairless Hills, Pa., Monday, Sept. 17, 2018. The candidates debated on Oct. 14. Another debate is scheduled for 8 a.m. to 9:30 a.m. Oct. 19. Here’s one sign of how friendly that territory is for Democrats: Pearl Kim’s biography page on her website has a picture of Democratic Gov. Tom Wolf and notes that she worked for Democratic Attorney General Josh Shapiro. Kim is the Republican candidate in the race. Delaware County, which makes up most of the district, saw historic Democratic wins in last year’s county council races. Democrat Mary Gay Scanlon, an attorney and education advocate, defeated nine others to win the party’s nomination. Kim was uncontested in the Republican primary. She has experience as a special victims prosecutor, and she has described herself as a sexual assault survivor. Pennsylvania has no women in Congress. As a BBC story about the 5th congressional race noted, Scanlon or Kim will change that. Part of the new 5th congressional district was previously represented by Republican Pat Meehan, who resigned from the U.S. House after a sexual harassment scandal. Scanlon and Kim are scheduled to debate Oct. 25 from 7 p.m. to 8 p.m. at Delaware County Community College. Before the Supreme Court redrew the maps, U.S. Rep. Ryan Costello, a Republican, expected a tougher re-election fight this year. But Costello dropped out of the race in March, telling MSNBC that he went from competing in a district that Hillary Clinton won by 1 point in 2016 to one that she would have won by 10 points. “In my district … the local Democrats and the left has become more engaged and, candidly, more angry by the week as President Trump says things and does things which many Republicans — myself amongst them — from time to time do disagree with,” Costello told MSNBC. Democrat Chrissy Houlahan is favored. She’s a former Air Force captain who served as chief operating officer for the athletic apparel company AND1. Houlahan is running against Republican Greg McCauley, a tax attorney and business investor. WITF spoke with both candidates ahead of May’s primary. The two are scheduled to debate at 2 p.m. at the Henrietta Hankin Library, at 215 Windgate Road, in Chester County, according to the Daily Local News of Chester County. One race looks good for Democrats, and the other looks good for Republicans. About the race: The new districts have pitted two incumbents against each other: Republican Keith Rothfus, an attorney who was first elected in 2012, is facing off against Democrat Conor Lamb. The first of two debates between the candidates aired Oct. 8, according to WESA, which reported that the sharpest differences were over health care, Social Security and Medicare. Democrat Bibiana Boerio and state Sen. Guy Reschenthaler are competing for an open seat in a Republican-friendly district. Boerio told WESA that her experience as an automotive executive will help her. Reschenthaler is an attorney who served in the Judge Advocate General’s Corps, the legal arm of the Navy, during the Iraq War. Dems are hoping to hoping to hold on to a seat in the northeast and pick up one in northwest. Republican Mike Kelly, whose family has a long history in the car dealership business, has said he was angered by the federal bailout of General Motors in 2009, and that inspired him to run for Congress. He was elected in 2010. He is running against Democrat Ron DiNicola, a Marine veteran and attorney. The two debated on Oct. 8, and at times they referenced the negative ads they have traded. A Kelly campaign ad claimed DiNicola “Represented America’s Worst Criminals” as an attorney. Kelly made a similar statement during the Oct. 8 debate. He said most of the cases that Kelly’s campaign referenced were 25 or 30 years old, and he was assigned to take on those cases by a judge or senior partners. Meanwhile, a DiNicola campaign ad claimed Kelly “gave a tax loophole to car dealerships like his. His company got a huge tax break.” That was a reference to changes in the 2017 tax bill. During the debate, Kelly dismissed the criticism. A third candidate in the race, Libertarian Ebert Beeman, was not included in the debate. 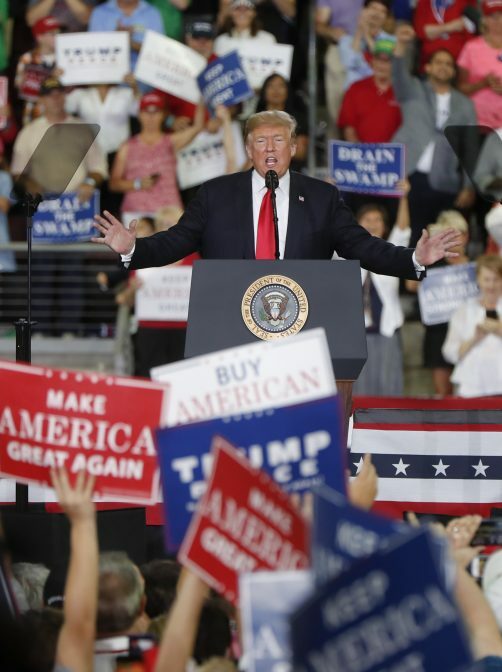 President Donald Trump visited Erie on Oct. 10 and stumped for Kelly and other Pennsylvania Republicans, as WESA’s Chris Potter reported. Cartwright is running against Republican John Chrin, who has used his wealth from his career as an investment banker to help fund his campaign. Five of the Pennsylvania Democratic candidates are in the the Red to Blue program of the national Democratic Congressional Campaign Committee, which offers additional organizational and fundraising support to candidates: Wallace, Houlahan, Wild, Scott and DiNicola. 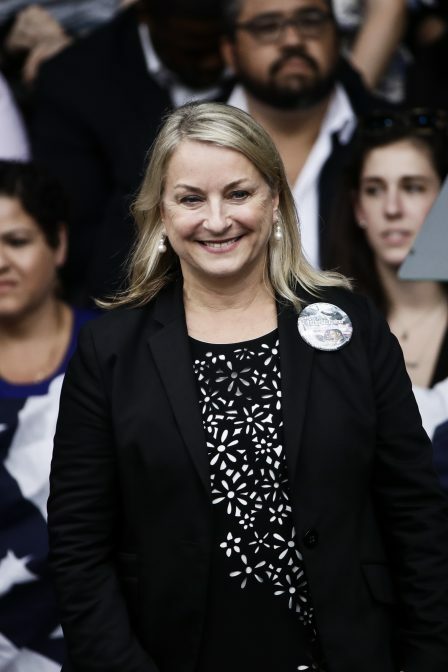 Democrat Madeleine Dean, a state legislator, is favored in the 4th congressional district, which includes most of Montgomery County. It is considered a solid Democratic district, even though it is an open seat. She is running against Republican Dan David. Democrat Jess King and the civic group Lancaster Stands Up were profiled by The Intercept, a national outlet, in an article with the headline “Real Resistance: A Grassroots Uprising in Amish Country Begins to Find Meaning in Politics.” She is challenging incumbent Republican Lloyd Smucker in the 11th congressional district, which is made up of all of Lancaster County and part of York County. It is rated a solid Republican district by The Cook Political Report. But FiveThirtyEight gives King better odds: 1 in 15.